LAST NIGHT OF THE PROMS – APPRECIATION! Handel’s Messiah was first performed in the Musick Hall, Fishamble Street, Dublin, in April 1742. It is fitting, therefore, that Witham Choral Society (WCS) chose to perform the work in Witham Public Hall. Today, most performances of this oratorio take place in churches or cathedrals. So, would this bold step to take Handel’s masterpiece back to the concert hall be a success? Well, I am pleased to say it was a resounding success, opening with an engaging and intimate performance of the sinfony by the orchestra. Another bold step taken by WCS was their decision not to engage a tenor soloist. Instead, many of the arias usually sung by the tenor were sung by the soprano soloist. Gill Wilson rose to the occasion, giving a plaintive account of Comfort ye my people, leading into Ev’ry valley shall be exalted, which she sang with a lightness of touch. On more familiar ground, her later rendition of Rejoice greatly O daughter of Zion was a liquid delight. The choir gave a robust rendition of And the glory of the Lord, and went on to give a lively account of For unto us a child is born. The consecutive trio of choruses in Part II was particularly effective: the mood of each was perfectly judged. The conductor, Patrick McCarthy, also sang the bass solos, singing Thus saith the Lord of hosts with a keen sense of drama. His voice had a pleasing resonant depth, which was most evident in his stirring account of Behold, I tell you a mystery, and The trumpet shall sound. Elaine Henson (mezzo-soprano) gave a delightful rendition of O thou that tellest good tidings to Zion, which was sung with conviction throughout, and she went on to give a lush and meaningful account of He was despised. There were many other highlights in this performance. There was great choral strength in Lift up your heads, and a rousing Hallelujah Chorus. Elsewhere, the cello and keyboard combined to good effect, and the off-stage and on-stage trumpet playing a joy. This was a perfect way to celebrate Patrick McCarthy’s twenty years at the helm of WCS. Long may it continue! 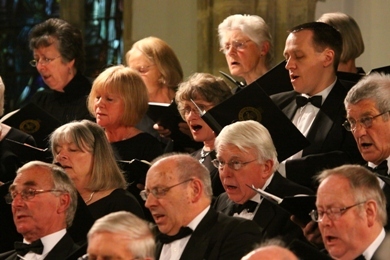 In recent years, Witham Choral Society have performed many gems of the choral repertoire, with first rate renditions of Messiah, Elijah and the St. John Passion. Their seasonal offering was another gem: J.S. Bach’s Christmas Oratorio. Wisely, however, they made judicious cuts to this unwieldy opus, and threw in some Holst, Berlioz and popular carols for good measure. The opening chorus of the oratorio, Christians Be Joyful! was, indeed, a joy. There was a resplendent sound from the choir, echoed by the tuneful timpani. The choral sound was responsive and fresh throughout the performance, and the assembled team of soloists were, as usual, on top form. As the Evangelist, Paul Hazelgrove-Spurin (tenor) fluently mastered the demands of Bach’s high writing; Elaine Henson (mezzo soprano) sang with warmth and feeling; and Richard Fallas (bass) delighted the audience with his resonant tones. Hot off the press, the choir, orchestra and soloists gave a colourful account of Peter Lawson’s arrangement of four carols by Gustav Holst. The familiar tune of In The Bleak Midwinter was given a lively makeover, making the poignant performance of Lullay My Liking all the more effective. The orchestra gave an atmospheric rendition of the overture from The Flight Into Egypt by Hector Berlioz, followed by a controlled and moving account of Thou Must Leave Thy Lowly Dwellings. The conductor, Patrick McCarthy, put a lot of thought into the make up of this programme, and his vision clearly paid off. This was a perfectly judged combination of Christmas music, and the sparkling encore, Irving Berlin’s White Christmas, sent everybody home with a sense that Christmas had really begun. Compelling Account of Musical Masterpiece……. St. Peter ad vincula Church, Coggeshall. Mendelssohn’s Elijah has many well-known episodes of high drama and emotion. The oratorio about the Old Testament prophet also has several sections of less interesting narrative and scene setting. In this performance, the Musical Director, Patrick McCarthy, gave equal measure to the narrative as to the drama, making it a compelling account of Mendelssohn’s masterpiece. In their many roles within the plot, the chorus was always on top form. They were suitably thoughtful and reflective in Blessed are the men who fear him, and perfectly balanced in Baal, we cry to Thee. In Behold, God the Lord passed by, a whole range of emotion was portrayed, from the destructive forces of earthquake and fire to the calming voice of the Lord. In the title role, Stephen Holloway (bass) had the lions share of the drama. With his resonant and articulate voice, he communicated all the nuances of the plot to the attentive audience. This was particularly evident in It is enough, O Lord, when his passionate singing was matched by the heartfelt playing of the lower strings. Elaine Henson (alto) sang with fervour throughout, and provided a magical moment when she seamlessly combined with the flute at the end of O rest in the Lord. Beverley Lockyer (soprano) was pure toned and expressive in Hear ye, Israel, and Richard Reaville (tenor) sang with authority and poise. There was also good support from Hannah Walker (girl soprano) and several members of the choir who, at various times, joined the soloists. With over two and a quarter hours of music, this complete rendition of Elijah was not for the faint hearted. 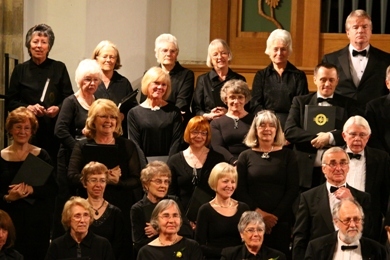 Witham Choral Society, the Colchester Philharmonic and the audience were all up for it. It was a rewarding and uplifting experience. ……..In their many roles within the plot, the chorus was always on top form. They were suitably thoughtful and reflective in Blessed are the men who fear him, and perfectly balanced in Baal, we cry to Thee. In Behold, God the Lord passed by, a whole range of emotion was portrayed, from the destructive forces of earthquake and fire to the calming voice of the Lord……. ……Throughout the performance, there was a perfect balance between the sections of the choir……This was a memorable concert that took us through the highways and byways of Handel’s monumental masterpiece.